This comprehensive book covers basic material properties, device structures and performance, image processing and zooming, optical communications, and biomedical imaging. 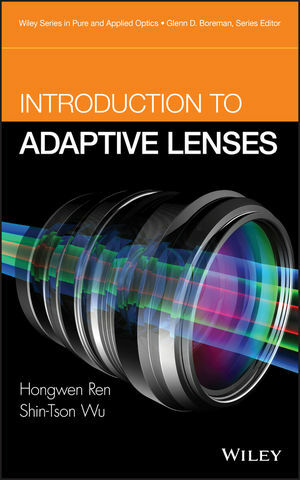 Readers will find homework problems and solutions included at the end of each chapter—and based on the described device structures, they will have the knowledge to fabricate adaptive lenses for practical applications or develop new adaptive devices or concepts for advanced investigation. HONGWEN REN, PhD, is an associate professor in the Department of Polymer-Nano Science Technology at Chonbuk National University in South Korea. A former research scientist at the University of Central Florida's College of Optics and Photonics, Dr. Ren has published over fifty journal papers, one book chapter, and obtained eight U.S. patents. SHIN-TSON WU, PhD, is a Pegasus Professor at CREOL, the College of Optics and Photonics, University of Central Florida. He is a recipient of the 2011 SID Slottow-Owaki Prize, 2010 OSA Joseph Fraunhofer Award/Robert M. Burley Prize, 2008 SPIE G. G. Stokes Award, and 2008 SID Jan Rajchman Prize. He is a Fellow of the IEEE, OSA, SID, and SPIE. Dr. Wu has coauthored six books and over 400 journal papers, and holds over seventy issued U.S. patents. He was also the founding editor-in-chief of the IEEE/OSA Journal of Display Technology.